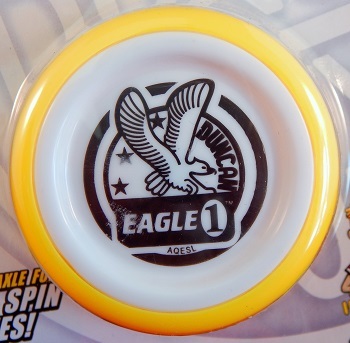 The Duncan Eagle 1 was designed for long spins times and looping. It used the main body molds from their popular Pro Z model (sans MOD Spacers and size A ball bearing), and changed the body material from polycarbonate to polystyrene. They also kept the price affordable by using a transaxle bearing system and a starburst response. As with most transaxle bearings you can modify the yo-yo's return sensitivity by adjusting the number of string wraps around the transaxle itself. This low maintenance, easy-to-use yo-yo is ideal for string tricks and looping. The cap on one side is imprinted with the current regular Duncan logo that includes the text "The Original. World's #1". The opposite side is imprinted with "Duncan Eagle 1". The latter imprint is reminiscint of the Duncan Flying Eagle patches from the 1950s. See also the Duncan Sonic Breath.